Lough Neagh has lost three-quarters of its duck population because pollution and sand extraction are destroying its ecology, according to conservationists. Northern Ireland’s unique laws mean the lough is not protected in the same way as similar bodies of water in the rest of the UK. The Earl of Shaftesbury, Nick Ashley-Cooper, has licensed five sand extraction firms to take a million tons of sand a year from the lough. It is then sold on, mostly to construction firms. The lough bed, shooting and fishing rights were gifted to his family in the 17th century. A recent study by Northern Ireland’s Centre for Biodiversity and Conservation Science found Lough Neagh’s ecosystem was floundering, with a huge decline in the numbers of insects and snails populating its bed and a 75% drop in the number of ducks spending winter there, because there is less to feed on. The 20-mile long, nine-mile wide lake is the largest body of fresh water in western Europe and supplies 40% of our water. But it also receives much of its treated sewage and agri-chemical run-off from farms, indicating a failure to properly manage the lough, which is also home to a huge portion of the world’s eel population. The practice of sand extraction has been going on for 60 years and is being allowed to continue because of laws unique to Northern Ireland. 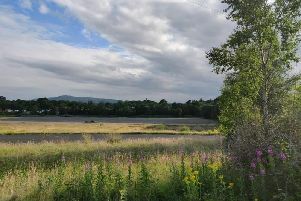 The lough is protected under the global Convention on Wetlands and is designated as a special protection area under the EU Birds Directive, but no official move has been made to stop the practice. Pressure groups have claimed that the Department of the Environment has been too slow to act on the issue and that the same practices would not be allowed in Scotland or England. James Orr, of Friends of the Earth Northern Ireland, said: “Lough Neagh is meant to be afforded the strictest protection. “It is inconceivable that this would be allowed in Loch Lomond in Scotland, or Lake Windermere in England. A notice was issued by the Department of the Environment earlier this year when it became clear that there was no planning permission for the extraction of sand. But the law here means the Earl can continue to take the sand until an appeal hearing. Ulster Wildlife and the RSPB are calling on the Earl of Shaftesbury and sand traders to be made to carry out a full environmental impact assessment to monitor the damage caused, and then seek planning permission. But the Earl said the sand extraction causes minimal damage and many people depend on it for their livelihood.